Employees working on problem-solving teams. What are the 5 Whys? 5 Whys is a problem-solving technique used to get to the root cause of an issue by asking “why?” 5 times (or more). Typically the first two or three answers to “why?” point to symptoms of problems and not to the root cause. Don’t limit your questioning to just 5 Whys. Keep asking “why?” until you think you have come to the end of the questioning trail – and then ask it one more time. The objective of the 5 Whys technique is to create a logical flow of causes about the process that lead to the root cause of the problem. 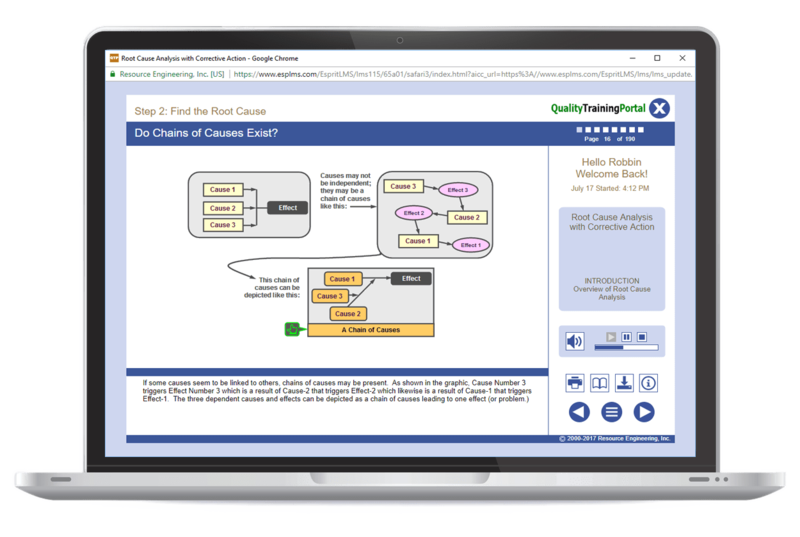 5 Whys training introduces learners to this problem-solving technique including how to formulate “why?” questions and then how to collect and analyze data to properly answer the questions. Examples of the questioning process in a variety of settings are provided and pitfalls to using the process are discussed along with strategies to avoid them. 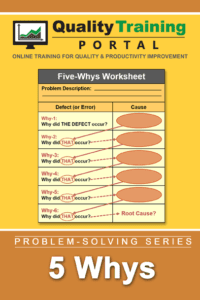 Use 5 Whys in a team setting to help get to the root cause of a problem. Avoid the typical pitfalls associated with using the 5 Whys. Apparent causes versus the root cause. Using Mistake-Proofing to eliminate the root cause of problems. Avoiding/preventing the pitfalls from occurring. Understand what the 5 Why technique is. Learn that the 5 Whys can help identify the root cause of a problem. Understand which type of “why” questions are effective and which are not. Recognize how mistake-proofing helps address a root causes by creating lasting solution. Be exposed to several 5 Why studies. Identify common threads for successful investigations using the 5 Whys. Understand how sustainable solutions can be constructed. Understand that there are common pitfalls that need to be avoided when using the 5 Why approach. Be familiar with ways to avoid common pitfalls. Lesson 1 | Asking "Why?" Understand which type of "why" questions are effective and which are not.